And when a chance encounter leads her to a man she knows only from her dreams, Vivian finds herself falling into a world that seems strange and familiar all at once—a world where the line between dream and reality is hard to determine, and hard to control. 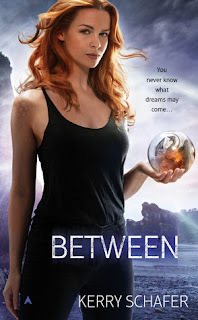 This is the first thing that drew me to BETWEEN, Kerry Schafer's debut novel and book 1 of her The Between series. When I saw it on a WoW post I immediately added it to my TBR because of the dragon element. Who doesn't love dragons?! These mythical creatures instantly add an enthralling layer of mystique, reverence and gleeful myth to any story, right?! BETWEEN has a very interesting premise. Dream walking, good vs. evil, unassuming heroine, and DRAGONS! Sadly it felt like a hodgepodge of mythologies and creatures to me although on the flipside, I love how KSchafer is obviously influenced by great classics like Arthurian myth and Lewis Carroll as their reach can be clearly seen and felt throughout the novel and I have to give her props for having a very interesting imagination. Unfortunately it didn't really work out all that great for me. BETWEEN's theme felt erratic with dragons, penguins, excalibur, sorcerers, knights, and princes in a medieval-like setting with the dreamscape having a rabbit-hole feel to it, the turn-over between worlds was jumpy it was hard for me to stick to the story. The structure of The Between's world is good, it's magical and fairy tale feel to it, stuff legends are made out of. It's very multi-dimensional as BETWEEN is set in present time and would shift to Surmise or people's dreamscapes so the world is very surreal and abstract. The shifting of the worlds so to speak felt choppy, the contrast between dreams and reality felt a little obscure and I felt lost at times. Like in the beginning, people were brought in the ER where Vivian works as a doctor and they would just self-combust and these patients would mention dragons. I can only surmise that these people's dreams were manipulated and haunted by the evil sorceress, Jehanna, but that wasn't explained or tied in the book. Then there's Zee, the Warlord in the Dreamscape but it currently a book owner in the real world. He tried to save Vivian in the real world but has an alternate ego in the Dreamscape. His reality/dreams would shift in certain chapters but to me, it didn't feel like the Dreamscape's reach extend to the real world. Confusing, I know. Another thing that didn't bode with me well was the character development didn't move on the same pace as the world-building. BETWEEN put much focus on the former for more than half of the novel before it became character-centric. The characters were highlighted during the conflict so I didn't really emotionally engage with Vivian, Zee and the rest of the characters. The character development was lacking in build-up IMHO so I didn't really see Vivian grow to her heroine status. For the most part, Vivian, like I was, was confused and grasping at straws trying to figure out what she is then suddenly she's this badass heroine, throwing F-bombs and shifting into a dragon. BETWEEN truly felt like a dream where it shifts and skips, a little desultory for my taste. Maybe it's just me and how fantastical the story is and I just don't have the right set of grey matter to fully appreciate KSchafer's imagination. Sadly, BETWEEN didn't excite me despite the dragons, dungeons and knights running around. Throughout the novel my emotions were even, too even that it was so easy for me to get distracted. However don't take my word for it, like I said maybe I'm just lacking in imagination to fully capture KShcafer's imagination so I suggest you still give it a whirl, you might end up liking it better than I did. Oh too bad this didn't wow you, as I really liked the cover and the synopsis! Mythology and fairy tale elements and dragons - it sounds amazing! :) I might check it out someday though, if just for the world-building. Thank you for the review! You're welcome and please, read it! True! I remember when I read Darkfever I was so thrown off but I'm so happy I read through because Fever is one of my all time favorite series! Christen loved it and I know you two have the same taste in books so I'm pretty sure you'll have a blast with this one.